» A Movie Review by Dan Stumpf: BLACK MAGIC (1949). A Movie Review by Dan Stumpf: BLACK MAGIC (1949). BLACK MAGIC. Edward Small Productions/United Artists, 1949. Orson Welles, Nancy Guild, Akim Tamiroff, Frank Latimore, Valentina Cortese, Margot Grahame, Berry Kroeger, Raymond Burr. Based on the novel by Alexandre Dumas p�re. Director: Gregory Ratoff. Call me nostalgic to the point of narcissism, but I enjoy revisiting from time to time the things that thrilled me as a kid, and at the tender age of Fourteen or so, I was convinced that Black Magic was the greatest film ever made. Well, the intervening forty-four years have dimmed its splendor somewhat, but This is still an enjoyably campy comic book of a movie, purportedly based on Alexandre Dumas’ tale of Cagliostro (Orson Welles) and the affair of the Queen’s necklace. The script is corny, Welles is hammy, and the direction (There are the usual rumors that Welles himself took a hand) over-emphatic, but it’s still fun, with swordfights, gypsy curses, hypnotic spells and lord-knows-what-all jamming its brief running time. Producer Edward Small made an industry (Not a cottage industry; a real celluloid-and-press-book industry) out of adapting Dumas, whose works were in public domain, on the screen (with varying degrees of faithfulness) a passion that started with The Count of Monte Cristo in 1934, right up to Black Magic in �49, with a stop along the way for James Whale’s The Man in the Iron Mask. Small moved on to other projects, such as Witness for the Prosecution and It! The Terror from Beyond Space, until he at last turned to popcorn fantasy and finished his career with The Wicked Dreams of Paula Schultz, which at last gave us Elke Sommer naked. 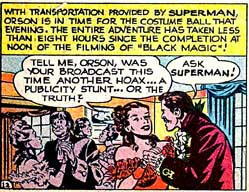 For Black Magic, he seems to have stuffed ten pounds of Publicity into a Five-Pound-Bag, with outlandish posters, breathless trailers and even a tie-in with Superman comics, a feat of dubious artistry maybe, but executed with a modicum of wit. Black Magic is a wonderful film. Not a great one, but wonderfully entertaining on almost all levels, with Welles at his hammy best. It’s based on three books, Memoirs of a Physician, Joseph Balsamo (Cagliostro’s real name), and The Queen’s Necklace, though very loosely. Watch closely for Raymond Burr as Alexandre Dumas fils in a scene with Barry Kroeger well cast as Dumas pere. Just a brief historical note. While briefly exiled in England Cagliostro was swindled out of a fortune by George Barrington, the handsome actor and rogue known as king of the pickpockets, the Picaroon (no relation to Herman Landon’s cracksman of the same name). Barrington later escaped the noose and was transported to Australia where he became a noted magistrate. A fictionalised version of the affair was covered in Ernest Dudley’s (author of the Dr. Morelle mysteries and creator of BBC radios Armchair Detective) historical novel The Picaroon, though Barrington doesn’t mention it in his memoirs (which sadly only deal with his reform and not his skullduggery). For an interesting take on Cagliostro check out the Black Coats Press, and French Wold Newton sites, where Jean Lofficier has created a history of Balsamo suggesting he was an immortal who became, among others, Arthur Gordon Pym, the Count of Monte Cristo, Captain Nemo, and Robur. Maurice Le Blanc also gave him a daughter, Josephine Balsamo, the Countess Cagliostro, who battles Arsene Lupin in The Countess Cagliostro and Revenge of the Countess Cagliostro (the 2004 French film Arsene Lupin is based on these two books with elements from many of Le Blanc’s other Lupin novels). But all that aside, Black Magic is great fun however little history there is to it, and as Dan says it is clear Welles took some directorial hand. There’s a nice scene near the end when Franz Mesmer shows up at Cagliostro’s trial. If you like Black Magic you might also like A Scandal in Paris, directed by Douglas Sirk, a charming tale of skullduggery with George Sanders surprisingly well cast as the father of detectives (and rogues) Eugene Francois Vidoq. It’s finally available on DVD and I think has been on TCM. Add Anthony Mann’s Reign of Terror, and maybe Edgar Ulmer’s Bluebeard, and you can have a nice minor French film festival without having to deal with subtitles. David, I suspected that I was going to catch your eye with this review. I was going to wait a day or so to post Dan’s follow-up to this one, but I think I might as well go ahead and see if I can’t get it online tonight. Just read the review of the book, and commented on it. Both very much along the lines of my interests and tastes. Incidentally the director of Black Magic, Gregory Ratoff was a well known character actor whose face you would recognize if you saw it. Ratoff produced films like The Corsican Brothers and Moss Rose, and starred in I’m No Angel, Under Two Flags, All About Eve, The Sun Also Rises, and Exodus among many others. He was a Russian emigree who had fought in the Russian army in WWI. 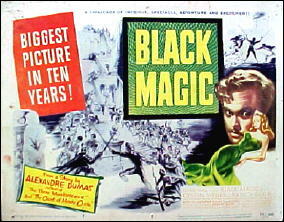 The screenplay for Black Magic was by Charles Bennett whose work included many of Hitchcock’s films like The 39 Steps, The Man Who Knew Too Much, and Foreign Correspondent, as well as several de Mille films (Reap the Wild Wind, Unconquered), the horror classic Night of the Demon, Voyage to the Bottom of the Sea, the noir classic Where Danger Lives. Among many he did for television was the 1954 adapatation of Casino Royale on Climax! Since Welles usually took a hand in the writing too, he likely contributed to the screenplay. Black Magic is something of a cult film, but somewhat better than that implies. It may be more interesting now than it was then, but it has a great deal of charm and style, and it’s always interesting to see Welles, even when he is hamming it up, especially with the wonderful Akim Tamiroff in fine support. Count Cagliostro (Giuseppi Aka Joseph Balsamo), and his contemporary the Comte de Saint-Germain, were con men who took advantage of the fancy in the French court of the 18th century for the occult and passed themselves off as sorcerors, alchemists, immortals, and nobility while living the high life and defrauding everyone while mixing in political intrigue. Cagliostro’s alleged involvement in the complex affair of the Queen’s necklace (in the film The Queen’s Necklace, not based on Dumas novel, Christopher Walken played him) contributed to Marie Antoinette’s unpopularity and the outbreak of the French Revolution. Some historians even believe it was the spark that fired the revolution. Ever since, Cagliostro and Saint-Germain have been favorites in fiction, the latter the subject of a long series of novels by Chelsea Quinn Yarbro who turned him into a vampire. Schiller, Goethe, and Tolstoy all wrote about Cagliostro and in recent years he has shown up in comic books as everything from an ancestor of DC comics magical Zatanna to a villain in Lee Falk’s The Phantom. The Castle of Cagliostro is a Japanese anime featuring Lupin III and directed by the noted Hayao Myazaki, though Cagliostro features in name only. Cagliostro also features in works by Alfred Bester, Umberto Eco, Robert Anton Wilson, and Kim Newman and as the arch enemy of Dracula in the Marvel comic Tomb of Dracula. Jean and Randy Lofficier have written a complex history of Cagliostro suggesting he was the model for Poe’s Arthur Gordon Pym, Dumas Monte Cristo, Verne’s Nemo and Robur and others and also used him in their comics about Nemo and Robur (the latter run in Heavy Metal). The old boy still gets around quite a bit. You can’t keep a good bad guy down, it seems. It’s a very Garbled adaptation of the 2 Dumas novels it draws on. But I enjoyed it. Dumas novel was itself not what he wanted it to be, Dumas did not originally want ti’s Supernatural aspect to be naturalized. Recently caught BLACK MAGIC on TCM On Demand and have to agree that it’s lots of fun, including that climactic swordfight. What I really liked was the presentation of hypnosis as both simple and powerfully effective, which is always an entertaining theme. 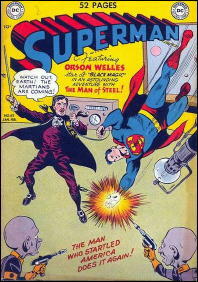 Now, if I can just get that SUPERMAN comic, I’ll know what really happened.